Until now, I have been willing to go along with the conventional wisdom that Iraq did not possess significant stockpiles of WMDs prior to the 2003 war. Leftover chemical munitions were discovered here and there during and after the invasion, but it was plausible to think that they were odds and ends, not part of a usable stockpile subject to the regime’s control. Sarin is one of the deadliest of nerve agents; just 1 to 10 milliliters on the skin can be fatal. So a concentration in a rocket of up to 25% purity would seem to be lethal. 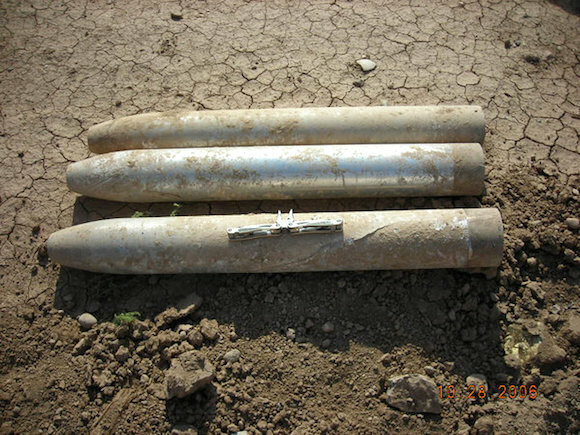 Since May 2004, Coalition forces (CF) have recovered at least 501 pre-1991 Gulf War Iraqi chemical weapons-including 448 122-mm al Borak rocket warheads, many of which contain the nerve agent sarin (GB). The most interesting discovery has been a 152mm binary Sarin artillery projectile—containing a 40 percent concentration of Sarin—which insurgents attempted to use as an Improvised Explosive Device (IED). The existence of this binary weapon not only raises questions about the number of viable chemical weapons remaining in Iraq and raises the possibility that a larger number of binary, long-lasting chemical weapons still exist. In my opinion, the revelation that more than 400 Borak rocket warheads armed with sarin were still extant after the 2003 war is of a different quality than prior reports of old stocks that were encountered here and there by American troops. These rockets were not, it appears, dispersed randomly in dumps and forgotten storage depots. One individual was able to produce more than 400 of them, suggesting that they most likely were stored and inventoried by the Baathist regime. If that is the case, the conventional belief that the world’s intelligence agencies were wrong, and Iraq did not possess significant stockpiles of WMDs prior to the 2003 war, is incorrect. One shudders to think what a terrorist group could accomplish with 400 sarin-equipped rockets.